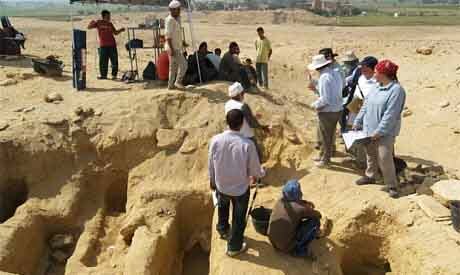 The Egyptian antiquities ministry has decided to halt its cooperation with an American mission working near Fayoum after accusing the mission of making false statements about the discovery of a necropolis. According to a ministry statement, the decision comes after the Brigham Young University mission gave false information to a British newspaper about its excavations in Fag Al-Gamous village in Upper Egypt. The BYU mission announced that its excavators were working in an ancient necropolis dating back some 2,000 years which contains an estimated one million burials. Press reports described the burials as mummies. The mission has been working on the site for 28 years. He said that only one mummy has been unearthed at the site, in 1980, and it is now on display at the Egyptian Museum in Cairo. What the mission has discovered, he continued, are thousands of human skeletons and remains of human bones which are very poorly conserved. Khalifa also stated that the mission had failed to respect the ministry’s regulations and had broken the law, which stipulates that no foreign mission is allowed to announce a discovery without the approval of the ministry’s permanent committee. Egypt wants to control History! They have been hiding the artifacts still hidden under the Giza plateau as well as the sphynx. There are massive underground tunnel systems linking up under the sand. They want that fact hidden as well. Why would they want to hide this? The pyramids predate Egypt by millennia, however, Egypt wants you to believe they are the ones that achieved these feats. Therefore they control all information about discoveries and filter for what they want released. Hence the Ministry's permanent committee. The Sumerians knew the pyramids existed and they predate the Egyptians. History is completely wrong and thanks to things like this the truth will remain in the dark. Google,about how they told the team that discovered chambers underneath the sphynx that they could no longer investigate there. The Egyptian ministry's permanent council wants to control every discover because they want you to believe that they are the ones who achieved these feats. the Sumerians knew about the pyramids and they predate the Egyptians. Google how they told the research team in the 80's they could no longer investigate the chambers they discovered underneath the Sphynx. Unfortunately the truth will remain in the dark and many of the vast mysteries of Egypt will remain unsolved. A mormon mission in Egypt. Glad they lost their permit. Trouble makers. They dont belong there. Jenny your right - mormons dont belong in egypt or digging in general especially since they dont even have a college edication or digrees of science. its proably best they leav it up to actual scientists and people who know what their talking about like jenni amirite? Mormon mission? Not even close. It was a BYU excavation and research team. I am not sure how they are trouble makers. They have been there 28 years and have done well during that time. It seems they belong there as much as any research team. I think it is unfortunate that stating the density of bodies multiplied by the area of the burial site equals a new discovery and hence a broken law. The bar for breaking the law in Egypt seems pretty low to me.